Mission Valley Branch Library commissioned by the City of San Diego, The Sycamore Leaf Canopy, 2002. 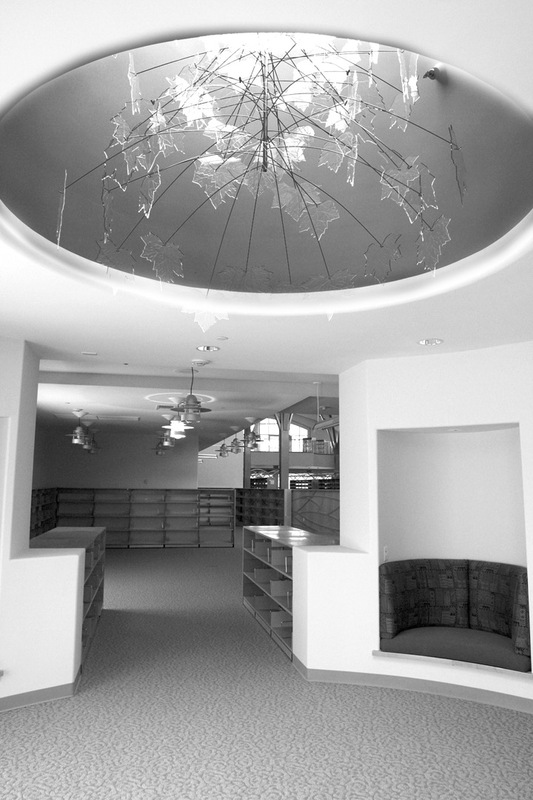 Mission Valley Branch Library, The Sycamore Leaf Canopy, 2002. Mission Valley Branch Library, The Sycamore Leaf Canopy and The Railing of Wild River Grasses, 2002. 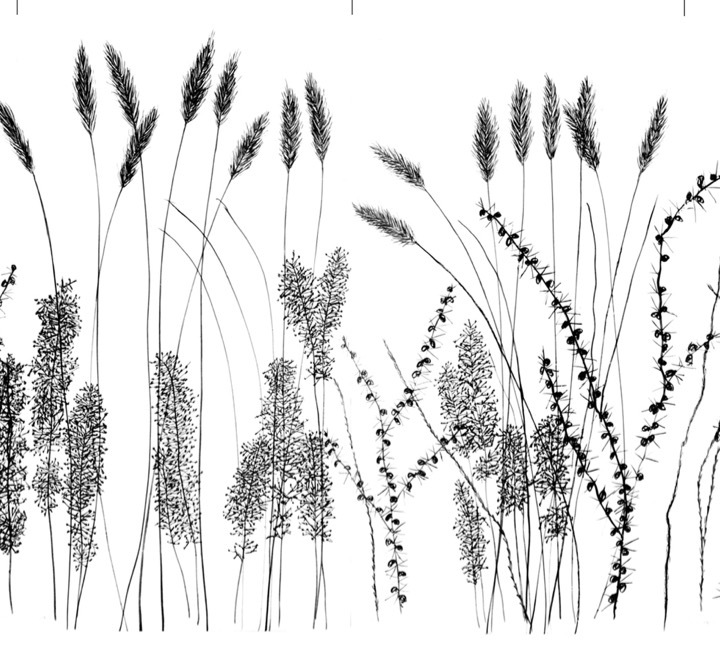 Mission Valley Branch Library, Drawing for The Railing of Wild River Grasses, 2002. 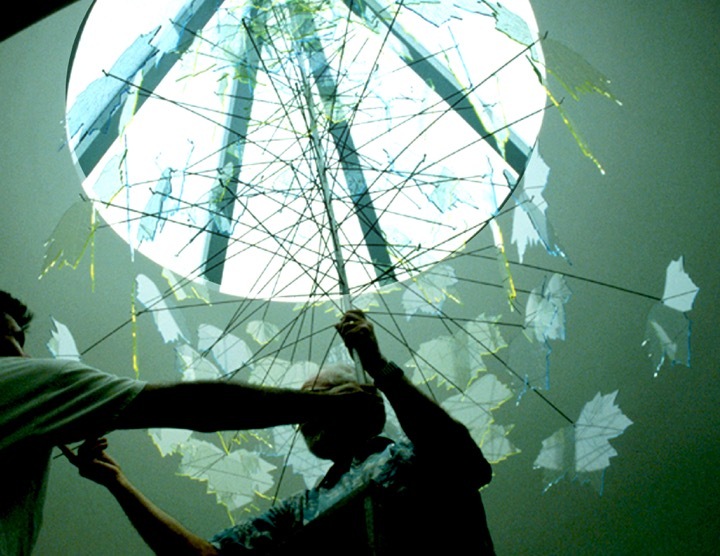 Mission Valley Branch Library, The Sycamore Leaf Canopy, (installation view), 2002. 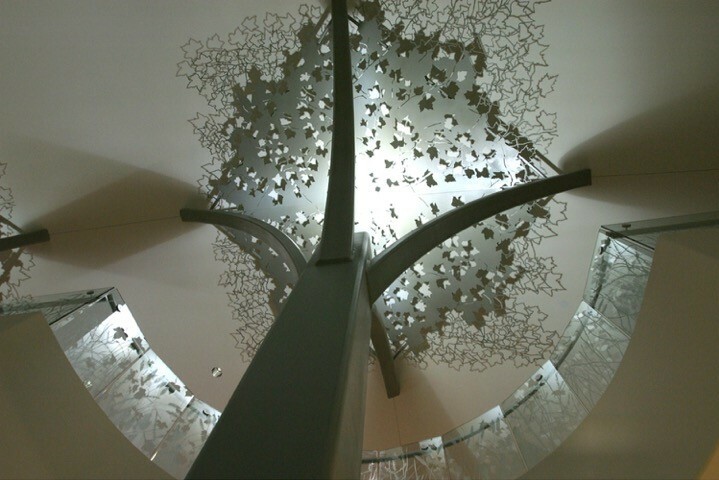 Mission Valley Branch Library, The Sycamore Leaf Cascade, (installation view), 2002. 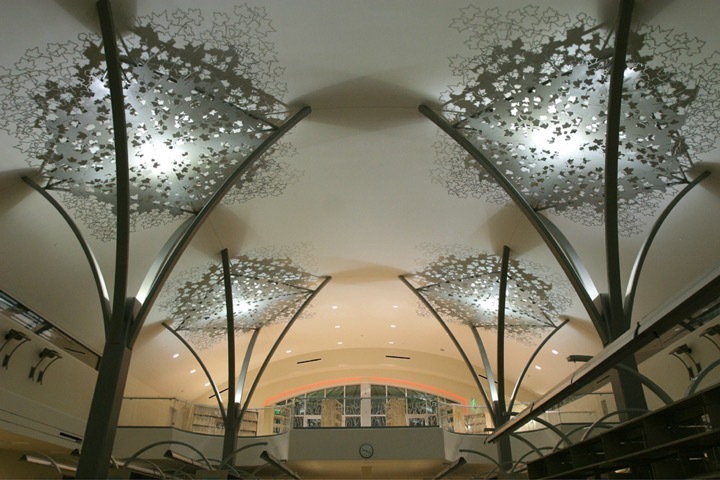 Joyce Cutler-Shaw, Mission Valley Branch Library commissioned by the City of San Diego, The Sycamore Leaf Canopy, 2002. The artist’s three works for the Mission Valley Branch Library, which opened to the public July 20, 2002, were commissioned by The City of San Diego, through the San Diego Commission for Arts and Culture. The artist conceived the artworks as part of the Design Team of WWB Architects at the invitation of design architect Richard Blackman. The theme of the Mission Valley Branch Library is the San Diego River, a primary natural resource of San Diego's Mission Valley. Riverbanks are a habitat of native California sycamore trees and wild river grasses, which have inspired Cutler-Shaw's designs for her library installations. 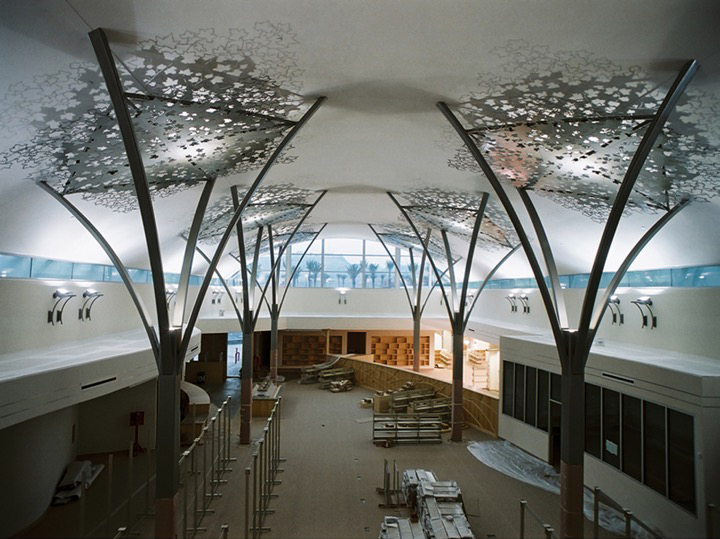 The Sycamore Leaf Canopy panels, of the eight library's structural columns cast leaf shadows on the library's curved barrel ceiling. They are a visual metaphors for the sheltering bower of a tree. The Sycamore Leaf Cascade suggests the falling leaves of the deciduous sycamores. The glass Railing of Wild River Grasses for the balcony and staircase is etched with images of native grasses such as fountain grass and wild mustard. The three works are a response to the library as an oasis-as a sheltered retreat. Cutler-Shaw's concepts, visualized through drawing, were translated to etched glass and to panels of plasma cut steel, translating her belief that public works should be integral to their settings and incorporated into their building and landscape sites-visually and conceptually. Here, it is to bring to awareness the surrounding natural landscape, that has been hidden and lost. 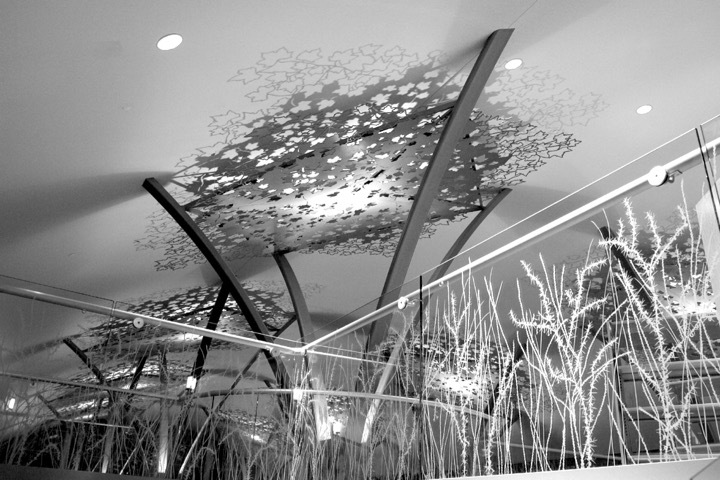 The Sycamore Leaf Canopy is composed of eight, 16 by 16-foot sections of 1/4 inch plasma cut steel. Each section is set within one of the eight structural columns, which support the arched library ceiling. The designs were translated from the artist's original drawings through more than 300 hours of computer programming. 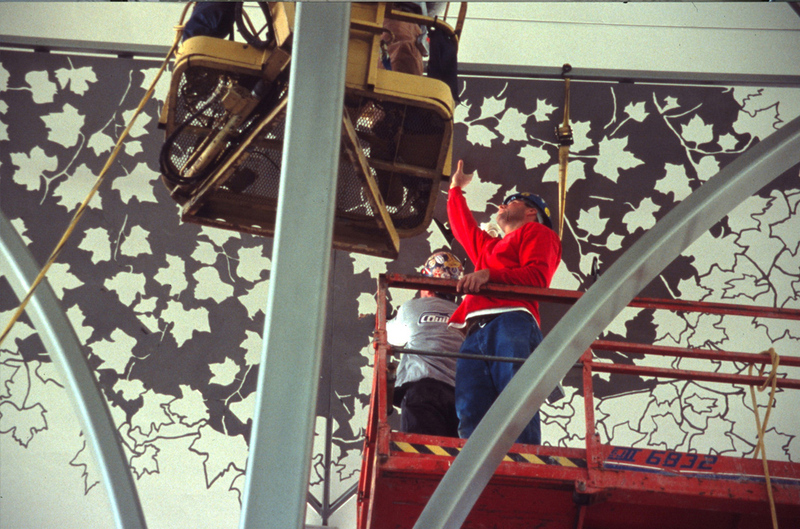 The Sycamore Leaf Canopy was awarded a 2002 San Diego American Institute of Architects Award, as a Divine Detail, and the library itself was awarded Best Institutional Design. 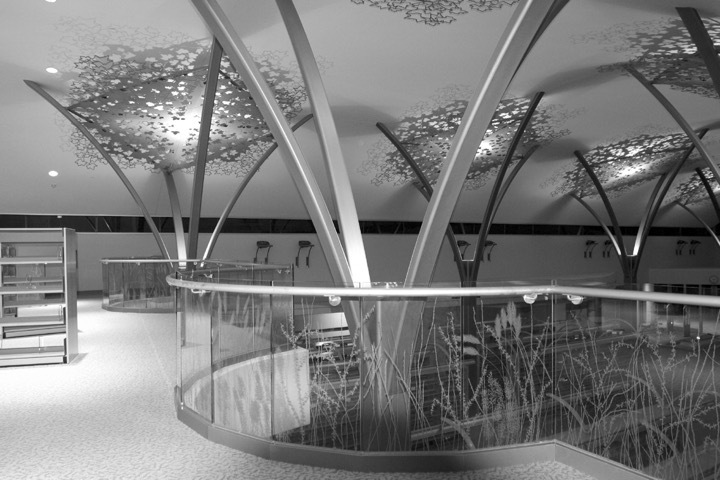 The Railing of Wild River Grasses consists of thirty-nine etched glass panels, each from a unique drawing. The panels are 42 inches high, and from 22 to 53 inches wide, of 1/4 inch tempered glass, for the balcony and staircase. The design was informed by typical species of wild grasses of Mission Valley, such as gooseberry, fountain grass, mugwort, and wild mustard. The Sycamore Leaf Cascade is composed of 180 laser-cut leaf forms of clear acrylic, with iridescent “edge light” in either brilliant blue or yellow green. 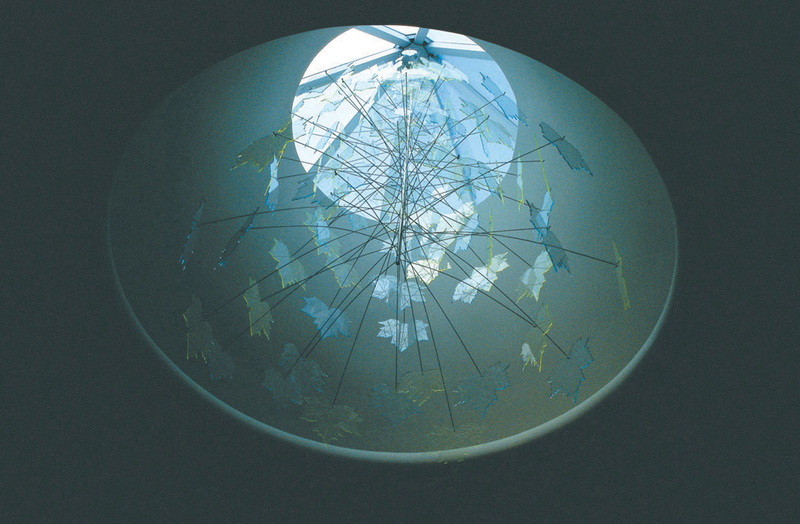 It is a hanging sculpture, 8 feet high by 2 to 7 feet wide installed in the conical skylight in the young children's reading room.